A stunning pearl, diamond and emerald art deco brooch by the renowned jewellers Van Cleef & Arpels topped Bonhams Fine Jewellery sale, making £1,138,850, yesterday, 6th December 2012. The brooch, which was estimated at £250,000 – 350,000 was among several lots which far exceeded their estimates, in a sale which realised over £6 million and sold 93 per cent by value. In a packed saleroom, bidders entered a series of fierce battles for the striking designs and rare pieces. Among the most highly anticipated lots were several museum-quality pieces by Van Cleef & Arpels, the jeweller favoured by stars such as Grace Kelly and Elizabeth Taylor. 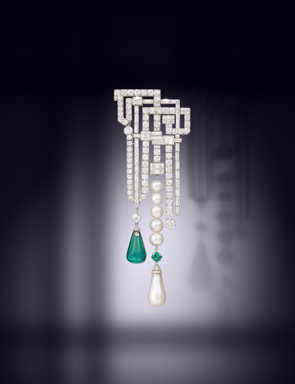 In addition to the exquisite brooch, designed as a geometric labyrinth of diamonds with two main pendants of emerald and pearl, two further Van Cleef & Arpels pieces made prices well over their estimates. 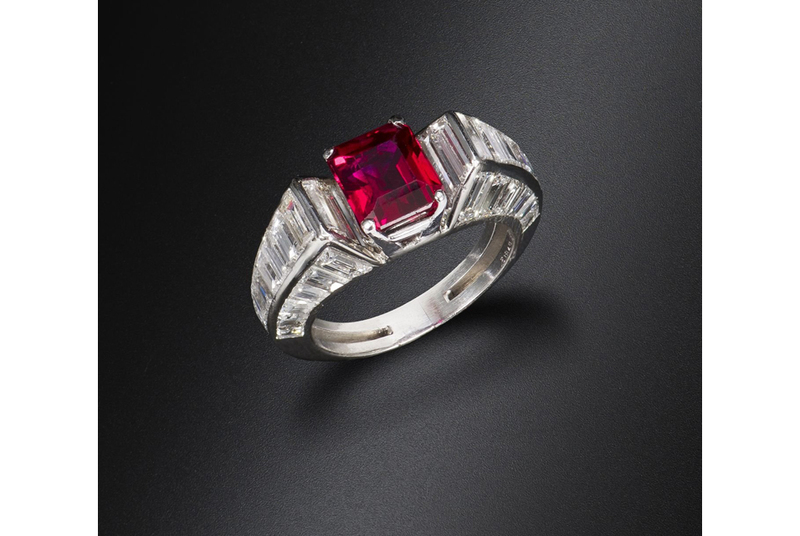 A 3.26 carat Burmese ruby and diamond ring sold for £277,250, equivalent to an outstanding £85,000 (US$136,000) per carat. Other exceptional prices were achieved for diamonds, with an elegant asscher-cut single-stone ring of 19.56 carats (I colour, VVS2 clarity) realising £858,850 against a pre-sale estimate of £315,000 – 440,000 or £43,900 (US$70,200) per carat.